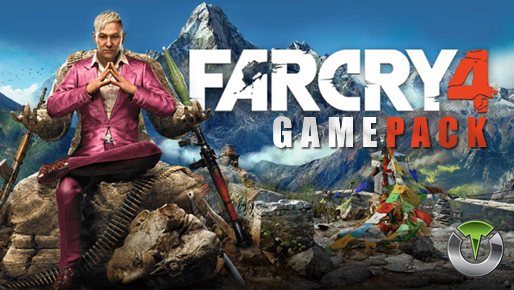 Far Cry 4 Gamepack for Titan One device. Titan One Exclusive Feature: Far Cry 4 Gamepack. The ADS (scoping) disables rapid fire and/or burst fire. The ADS (scoping) enables rapid fire and/or bust fire. Rapid fire and/or burst fire will only be activated by fully pressing the fire button. If secondary rapid fire is enabled it will take place when the regular rapid fire is not actuating. For example if your regular rapid fire is only active when scoping then the secondary rapid fire will be activated when you are not using ADS (scope). This behavior can be very handy to set a precise rate of fire while aiming and a more aggressive rate of fire while hipfiring. Anti-Recoil is activated while firing and scoping (ADS). Anti-Recoil is activated while firing and NOT scoping (ADS). Anti-Recoil with inverted Y-Axis is activated while firing and scoping (ADS). Anti-Recoil with inverted Y-Axis is activated while firing and NOT scoping (ADS). With accelerometer aim assist, you can use the PS4 or PS3 controller to aim while scoping. This means you can move the controller to adjust the target position when scoped in. This MOD will not affect aiming with the right stick. It will only add an additional option to aim with. Each of the modes will add sensitivity with mode 1 being the least sensitive and mode 5 being the most sensitive. Your character will sprint at the same time you begin to move forward. Your character will sprint if the thumbstick is FULL forward. The character will walk normally if the thumbstick is only slightly forward. This MOD is specially designed for sniper rifles. It automatically holds the sniper's breath when scoping in (ADS). Upon activation, the MOD will hold the sniper's breath. The player no longer has to push the left thumbstick to hold breath. With the Button Layouts you can make any of the MODS on the Titan One work with your favorite button layout.